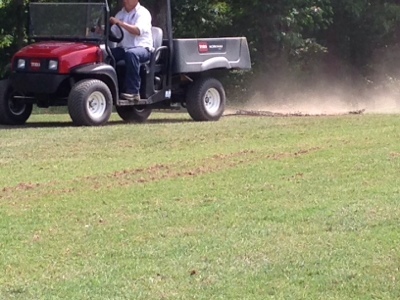 All Bermuda grass playing surfaces have been aerated. Cleaning up is growing on as I make this blog post. The fairways are aerated with the pull behind units. It removes a 3/4 inch tines every 6 inches. This helps with plant health and water infiltration. 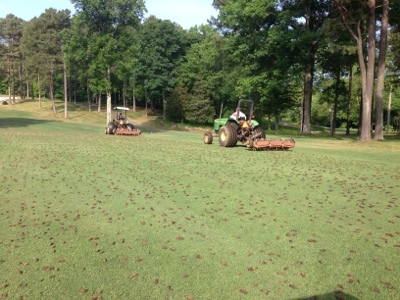 We also perform a more aggressive aeration to the green surrounds and tee tops. In these areas we remove a half inch size plug every 2.5 inches. 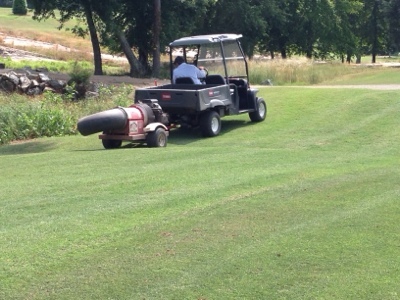 Blowing off the plugs so we can get out and mow. We are ready for this week to be over with!